Boone served as a militia officer during the Revolutionary War (1775–83), which, in Kentucky, was fought primarily between the American settlers and British-allied Native Americans, who hoped to expel the Americans. Boone was captured by Shawnee warriors in 1778. He escaped and alerted Boonesborough that the Shawnee were planning an attack. Although heavily outnumbered, Americans repelled the Shawnee warriors in the Siege of Boonesborough. Boone was elected to the first of his three terms in the Virginia General Assembly during the Revolutionary War, and he fought in the Battle of Blue Licks in 1782. Blue Licks, a Shawnee victory over the Patriots, was one of the last battles of the Revolutionary War, coming after the main fighting ended in October 1781. Daniel Boone was of English West Country and Welsh ancestry. Because the Gregorian calendar was adopted during his lifetime, Boone's birth date is sometimes given as November 2, 1734 (the "New Style" date), although Boone used the October date. The Boone family belonged to the Religious Society of Friends, called "Quakers", and were persecuted in England for their dissenting beliefs. Daniel's father, Squire (his first name, not a title) Boone (1696–1765) emigrated from the small town of Bradninch, Devon (near Exeter) to Pennsylvania in 1713, to join William Penn's colony of dissenters. Squire Boone's parents, George Boone III and Mary Maugridge, followed their son to Pennsylvania in 1717, and in 1720 built a log cabin at Boonecroft. In 1720, Squire Boone, who worked primarily as a weaver and a blacksmith, married Sarah Morgan (1700–77). Sarah's family were Quakers from Wales, and had settled in 1708 in the area which became Towamencin Township of Montgomery County. In 1731, the Boones moved to Exeter Township in the Oley Valley of Berks County, near the modern city of Reading. There they built a log cabin, partially preserved today as the Daniel Boone Homestead. Daniel Boone was born there, November 2, 1734, the sixth of eleven children. The Daniel Boone Homestead is four miles from the Mordecai Lincoln House, making the Squire Boone family neighbors of Mordecai Lincoln, the great-great-grandfather of future president Abraham Lincoln. Mordecai's son, also named Abraham, married Ann Boone, a first cousin of Daniel. Daniel Boone spent his early years on what was then the edge of the frontier. Several Lenape Indian villages were nearby. The pacifist Pennsylvania Quakers had good relations with the Native Americans, but the steady growth of the white population compelled many Indians to move further west. Boone was given his first rifle at the age of 12. He learned to hunt from both local settlers and the Lenape. Folk tales have often emphasized Boone's skills as a hunter. In one story, the young Boone was hunting in the woods with some other boys, when the howl of a panther scattered all but Boone. He calmly cocked his rifle and shot the predator through the heart just as it leaped at him. The validity of this claim is contested, but the story was told so often that it became part of his popular image. In Boone's youth, his family became a source of controversy in the local Quaker community when two of the oldest children married outside the endogamous community, in present-day Lower Gwynedd Township, Pennsylvania. In 1742, Boone's parents were compelled to apologize publicly after their eldest child, Sarah, married John Willcockson, a "worldling" (non-Quaker). Because the young couple had "kept company", they were considered "married without benefit of clergy". When the Boones' oldest son Israel married a "worldling" in 1747, Squire Boone stood by him. Both men were expelled from the Quakers; Boone's wife continued to attend monthly meetings with their younger children. Because Boone grew up on the frontier, he had little formal education, but gained deep knowledge of the woods. According to one family tradition, a schoolteacher once expressed concern over Boone's education, but Boone's father said, "Let the girls do the spelling and Dan will do the shooting." Boone received some tutoring from family members, though his spelling remained unorthodox. Historian John Mack Faragher cautions that the folk image of Boone as semiliterate is misleading, and argues that he "acquired a level of literacy that was the equal of most men of his times." Boone regularly took reading material with him on his hunting expeditions—the Bible and Gulliver's Travels were favorites. He was often the only literate person in groups of frontiersmen. Boone would sometimes entertain his hunting companions by reading to them around the evening campfire. After the French and Indian War (1754–1763) broke out between the French and British, and their respective Indian allies, North Carolina Governor Matthew Rowan called up a militia, for which Boone volunteered. He served under Captain Hugh Waddell on the North Carolina frontier. Waddell's unit was assigned to serve in the command of General Edward Braddock in 1755, and Boone acted as a wagoner, along with his cousin Daniel Morgan, who would later be a key general in the American Revolution. In the Battle of the Monongahela, the denouement of the campaign and a bitter defeat for the British, Boone narrowly escaped death when the baggage wagons were assaulted by Indian troops. Boone remained critical of Braddock's blunders for the rest of his life. While on the campaign, Boone met John Findley, a packer who worked for George Croghan in the trans-Appalachian fur trade. Findley first interested Boone in the abundance of game and other natural wonders of the Ohio Valley. Findley took Boone on his first fateful hunting trip to Kentucky 12 years later. Boone returned home and on August 14, 1756, he married Rebecca Bryan, a neighbor in the Yadkin River Valley. Her brother married one of Boone's sisters. The couple initially lived in a cabin on his father's farm. They eventually had 10 children. His son, Nathan Boone, was the first white child known to be born in Kentucky. Such frontiersmen often carved messages on trees or wrote their names on cave walls, and Boone's name or initials have been found in many places. A tree in present Washington County, Tennessee reads "D. Boon Cilled a. Bar on tree in the year 1760". A similar carving, preserved in the museum of the Filson Historical Society in Louisville, Kentucky, reads "D. Boon Kilt a Bar, 1803." The inscriptions may also be among numerous forgeries of the famous trapper, part of a long tradition of phony Boone relics. In 1758, a conflict erupted between the British forces and the Cherokee, their allies in the French and Indian War (which continued in other parts of the continent). After the Yadkin River Valley was raided by Cherokee, the Boones and many other families fled north to Culpeper County, Virginia. Boone served in the North Carolina militia during this "Cherokee Uprising". His militia expeditions went deep into Cherokee territory beyond the Blue Ridge Mountains and he was separated from his wife for about two years. On May 11, 1769, he began a two-year hunting expedition in Kentucky. On December 22, 1769, Boone and a fellow hunter, Benjamin Cutbirth, were captured by a party of Shawnees, who confiscated all of their skins and told them to leave and never return. The Shawnees had not signed the Stanwix treaty, and since they regarded Kentucky as their hunting ground, they considered white hunters there to be poachers. Boone, however, continued hunting and exploring Kentucky until his return to North Carolina in 1771, and returned to hunt there again in the autumn of 1772. On July 5, 1773, Boone packed up his family and, with a group of about 50 immigrants, began the first attempt by British colonists to establish a settlement in Kentucky. Boone was still an obscure hunter and trapper at the time; the most prominent member of the expedition was William Russell, a well-known Virginian and future brother-in-law of Patrick Henry. On October 9, Boone's eldest son James and a small group of men and boys who had left the main party to retrieve supplies were attacked by a band of Delawares, Shawnees, and Cherokees. Following the Treaty of Fort Stanwix, American Indians in the region had been debating what to do about the influx of settlers. This group had decided, in the words of historian John Mack Faragher, "to send a message of their opposition to settlement". James Boone and William Russell's son Henry were captured and gruesomely tortured to death. The brutality of the killings sent shock waves along the frontier, and Boone's party abandoned its expedition. Following Dunmore's War, Richard Henderson, a prominent judge from North Carolina, hired Boone to travel to the Cherokee towns in present North Carolina and Tennessee and inform them of an upcoming meeting. In the 1775 treaty, Henderson purchased the Cherokee claim to Kentucky to establish a colony called Transylvania. Afterwards, Henderson hired Boone and Cutbirth to blaze what became known as the Wilderness Road, which went through the Cumberland Gap and into central Kentucky. Along with a party of about 30 workers, Boone and Cutbirth marked a path to the Kentucky River, where they founded Boonesborough. Other settlements, notably Harrodsburg, were also established at this time. Despite occasional Indian attacks, Boone returned to the Clinch Valley and brought his family and other settlers to Boonesborough on September 8, 1775. On July 5, 1776, Boone's daughter Jemima and two other teenaged girls were captured outside Boonesborough by an Indian war party, who carried the girls north towards the Shawnee towns in the Ohio country. Boone and a group of men from Boonesborough followed in pursuit, finally catching up with them two days later. Boone and his men ambushed the Indians while they were stopped for a meal, rescuing the girls and driving off their captors. The incident became the most celebrated event of Boone's life. 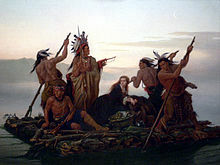 James Fenimore Cooper created a fictionalized version of the episode in his classic novel The Last of the Mohicans (1826). 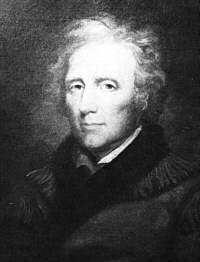 In 1777, Henry Hamilton, British Lieutenant Governor of Canada, began to recruit American Indian war parties to raid the Kentucky settlements. On April 24, Shawnee Indians led by Chief Blackfish attacked Boonesborough. Boone was shot in the ankle while outside the fort, but he was carried back inside amid a flurry of bullets by Simon Kenton, a recent arrival at Boonesborough. Kenton became Boone's close friend, as well as a legendary frontiersman in his own right. While Boone recovered, Shawnees kept up their attacks outside Boonesborough, destroying the surrounding cattle and crops. With the food supply running low, the settlers needed salt to preserve what meat they had, so in January 1778, Boone led a party of 30 men to the salt springs on the Licking River. On February 7, when Boone was hunting meat for the expedition, he was surprised and captured by warriors led by Blackfish. Because Boone's party was greatly outnumbered, Boone returned the next day with Blackfish and persuaded his men to surrender rather than put up a fight. After the siege, Captain Benjamin Logan and Colonel Richard Callaway—both of whom had nephews who were still captives surrendered by Boone—brought charges against Boone for his recent activities. In the court-martial that followed, Boone was found "not guilty", and was even promoted after the court heard his testimony. Despite this vindication, Boone was humiliated by the court martial, and he rarely spoke of it. After the Revolutionary War ended, Boone resettled in Limestone, then a booming Ohio River port. On his 50th birthday, historian John Filson published The Discovery, Settlement and Present State of Kentucke, a book which included a chronicle of Boone's adventures. Boone became a celebrity and kept a tavern, working as a surveyor, horse trader and land speculator. 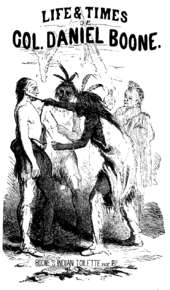 The border war with American Indians north of the Ohio River resumed with the Northwest Indian War. In September 1786, Boone took part in a military expedition into the Ohio Country led by Benjamin Logan. Back in Limestone, Boone housed and fed Shawnees who were captured during the raid, and helped to negotiate a truce and prisoner exchange. Although the war escalated and would not end until the American victory at the Battle of Fallen Timbers eight years later, the 1786 expedition was the last time Boone saw military action. The following year, he was elected to the Virginia state assembly as a representative from Bourbon County. Boone was initially prosperous, owning seven slaves by 1787 (a relatively large number for Kentucky at the time), but began to have financial troubles while living in Limestone. According to the later folk image, Boone the trailblazer was too unsophisticated for the civilization which followed him and which eventually defrauded him of his land. Boone was not the simple frontiersman of legend, however: he engaged in land speculation on a large scale, buying and selling claims to tens of thousands of acres. The land market in frontier Kentucky was chaotic, and Boone's ventures ultimately failed because his investment strategy was faulty and because his sense of honor made him reluctant to profit at someone else's expense. According to Faragher, "Boone lacked the ruthless instincts that speculation demanded." Boone lived much of the last part of his life with the family of his son Nathan in this home near present-day Defiance, Missouri. by John James Audubon, circa after 1810. We have been honored by a visit from Colonel Boon, the first settler of Kentucky; he lately spent two weeks with us ... He left this for the river Platt, some distance above. Col Boon is eighty-five years of age, five feet seven inches high, stoutly made, and active for one of his years; is still of vigorous mind, and is pretty well informed. He has taken part in all the wars of America, from before Braddock's war to the present hour. Daniel Boone died of natural causes (other sources say from acute indigestion) on September 26, 1820, at Nathan Boone's home on Femme Osage Creek, five weeks short of his 86th birthday. His last words were, "I'm going now. My time has come." He was buried next to Rebecca, who had died on March 18, 1813. The graves, which were unmarked until the mid-1830s, were near Jemima (Boone) Callaway's home on Tuque Creek, about two miles (3 km) from the present-day Marthasville, Missouri. In 1845, the Boones' remains were supposedly disinterred and reburied in a new cemetery, Frankfort Cemetery in Frankfort, Kentucky. Resentment in Missouri about the disinterment grew over the years, and a legend arose that Boone's remains never left Missouri. According to this story, Boone's tombstone in Missouri had been inadvertently placed over the wrong grave, but no one had ever corrected the error. Boone's relatives in Missouri, displeased with the Kentuckians who came to exhume Boone, kept quiet about the mistake, and they allowed the Kentuckians to dig up the wrong remains. No contemporary evidence indicates this actually happened, but in 1983, a forensic anthropologist examined a crude plaster cast of Boone's skull made before the Kentucky reburial and announced it might be the skull of an African American. Black slaves had also been buried at Tuque Creek, so it is possible the wrong remains were mistakenly removed from the crowded graveyard. Both the Frankfort Cemetery in Kentucky and the Old Bryan Farm graveyard in Missouri claim to have Boone's remains. The Kentucky Legislature appropriated two thousand dollars in 1860 for the erection of a monument over the grave of Daniel Boone in Frankfort. The monument at Boone's grave site today was built by John Haley in 1860. In 1862 four marble panels were added depicting scenes from Daniel and Rebecca's lives. The panels were vandalized during the American Civil War and restored in 1906. Only one of the original panels still exists. The vandalism of the monument during the Civil War does not appear to be senseless in nature. Lyman Beecher Hannaford of the 103rd Ohio Infantry who were garrisoned at Fort Hill in Frankfort, Kentucky remarks in his letter dated April 2, 1863, "I have been walking around in the cemetery and I got a piece of Daniel Boone's monument. ³ I shall keep it till I go home. I have quite a number of pieces of rock and shell that I am keeping for specimens." Daniel Boone remains an iconic figure in American history, although his status as an early American folk hero and later as a subject of fiction have tended to obscure the actual details of his life. Several places in the United States are named for him, including the Daniel Boone National Forest, the Sheltowee Trace Trail, the town of Boone, North Carolina, various settlements carrying the name of "Boonville", and seven counties: Boone County, Illinois, Boone County, Indiana, Boone County, Nebraska, Boone County, West Virginia, Boone County, Missouri, Boone County, Arkansas, and Boone County, Kentucky. Schools across the United States are named for Daniel Boone, including schools in Birdsboro, Pennsylvania, Douglassville, Pennsylvania, Richmond, Kentucky, Wentzville, Missouri, Warrenton, Missouri, Gray, Tennessee, and Chicago. Daniel Boone was honored with a 6-cent stamp in the American Folklore Series on September 26, 1968, at Frankfort, Kentucky, where his remains were supposedly reburied. He was a famous frontiersman in the development of Virginia, Kentucky and the trans-Appalachian west. A wall of roughly-hewn boards displays the tools of Boone's trade—a Pennsylvania rifle, a powder horn, and a knife. The pipe tomahawk represents that the Shawnees had adopted Boone. His name and birth date were carved on the wall. The U.S. Navy's James Madison-class Polaris submarine USS Daniel Boone (SSBN-629), was named after Boone. Boone emerged as a legend in large part because of land speculator John Filson's "The Adventures of Colonel Daniel Boon", part of his book The Discovery, Settlement and present State of Kentucke. First published in 1784, Filson's book was primarily intended to popularize Kentucky to immigrants. It was soon translated into French and German, and made Boone famous in America and Europe. Based on interviews with Boone, Filson's book contained a mostly factual account of Boone's adventures from the exploration of Kentucky through the American Revolution. However, because the real Boone was a man of few words, Filson invented florid, philosophical dialogue for this "autobiography". Subsequent editors cut some of these passages and replaced them with more plausible—but still spurious—ones. Often reprinted, Filson's book established Boone as one of the first popular heroes of the United States. Byron's poem celebrated Boone as someone who found happiness by turning his back on civilization. In a similar vein, many folk tales depicted Boone as a man who migrated to more remote areas whenever civilization crowded in on him. In a typical anecdote, when asked why he was moving to Missouri, Boone supposedly replied, "I want more elbow room!" Boone rejected such an interpretation of his life, however. "Nothing embitters my old age," he said late in life, like "the circulation of absurd stories that I retire as civilization advances ..."
In the 20th century, Boone was featured in numerous comic strips, radio programs, and films, such as the 1936 film Daniel Boone, with George O'Brien playing the title role. Daniel Boone was the subject of a TV series that ran on NBC from 1964 to 1970. In the theme song for the series, Boone was described as a "big man" in a "coonskin cap", and the "rippin'est, roarin'est, fightin'est man the frontier ever knew!" This did not describe the real Boone, who was not a big man and did not wear a coonskin cap. Boone was portrayed this way because Fess Parker, the tall actor who played him, was essentially reprising his role as Davy Crockett from an earlier TV series. That Boone could be portrayed the same way as Crockett, another American frontiersman with a very different personality, was another example of how Boone's image was reshaped to suit popular tastes. Boone's grandson Alphonso Boone was an early settler of the Willamette River Valley in Oregon, arriving in 1846 and establishing Boones Ferry the next year. Three generations of Boone's descendants have been Major League Baseball players: Ray Boone, Ray's son Bob Boone, and Ray's grandchildren Bret Boone and Aaron Boone. The singer Pat Boone also claims to be a direct descendant. ^ Faragher, Daniel Boone, 317. ^ For number of people, see Faragher, Daniel Boone, 351. ^ Michael C. C. Adams, "An Appraisal of the Blue Licks Battle," Filson Club History Quarterly (2001) 75#2 181–203. ^ For overview of Boone as early folk hero and American icon, as well as his enduring fame and the confusion of myth and history, see Lofaro, American Life, 180–83. ^ Bakeless, Master of the Wilderness, 7. ^ "National Historic Landmarks & National Register of Historic Places in Pennsylvania" (Searchable database). CRGIS: Cultural Resources Geographic Information System. Note: This includes E. Garrett Brinton (January 1982). "National Register of Historic Places Inventory Nomination Form: Boonecroft" (PDF). Archived from the original (PDF) on June 19, 2013. Retrieved September 15, 2012. ^ Faragher, Daniel Boone, 9. ^ Lagle, Andrew (July 31, 2007). "Map of Davie County, N. Carolina Showing Original Land Grants". Daniel Boone; The extraordinary life of a common man. Drums, PA: Margy Miles. Archived from the original on April 25, 2012. Retrieved September 4, 2010. ^ Faragher, Daniel Boone, 25–27; Bakeless, Master of the Wilderness, 16–17. For baptizing children, see Faragher, Daniel Boone, 311. ^ Faragher, Daniel Boone, 16–17, 55–6, 83. ^ Wallace, Paul A. W. (1 August 2007). 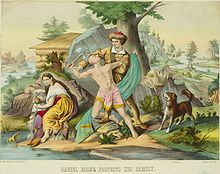 "Daniel Boone in Pennsylvania". DIANE Publishing Inc. – via Google Books. ^ Draper, Lyman C. (1998). Belue, Ted Franklin (ed.). The Life of Daniel Boone. Mechanicsburg, PA: Stackpole Books. Retrieved August 27, 2014. ^ "The life of Daniel Boone (1734–1820)". The Daniel Boone and Frontier Families Research Association. Retrieved March 21, 2013. ^ Appletons' annual cyclopaedia and register of important events of the year: 1862. New York: D. Appleton & Company. 1863. pp. 663–664. ^ Faragher, Daniel Boone, 65. ^ For market hunting, see Bakeless, Master of the Wilderness, 38–39. ^ For doubts about tree carvings, see Faragher, Daniel Boone, 57–58; Belue's notes in Draper, Life of Daniel Boone,163, 286; Elliott, Long Hunter, 12. For historians who do not doubt the tree carvings, see Lofaro, American Life, 18; Bakeless, Master of the Wilderness, 33. Faragher and Belue generally question traditional stories more than Bakeless, Elliott, and Lofaro. ^ Faragher, Daniel Boone, 62–66. ^ McDermott, Forrest (December 18, 2011). 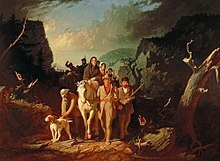 "Daniel Boone's First Steps in Kentucky". The Historical Marker Database. HMdb.org LLC. Retrieved 2017-12-31. ^ Faragher, Daniel Boone, 69–74. According to some versions of the story, Findley specifically sought out Boone in 1768, but Faragher believes it more likely that their second meeting was by chance. ^ Faragher, Daniel Boone, 89–96, quote on 93. ^ For Boone in Dunmore's War, see Lofaro, American Life, 44–49; Faragher, Daniel Boone, 98–106. ^ When, exactly, Henderson hired Boone has been a matter of speculation by historians. Some have argued that Boone's first expeditions into Kentucky might have been financed by Henderson in exchange for information about potential places for settlement, while Boone's descendants believed Henderson did not hire Boone until 1774. For doubts that Henderson hired Boone before 1774, see Faragher, Daniel Boone, 74–76, 348. ^ Faragher, Daniel Boone, 130. ^ For Boone's influence on James Fenimore Cooper, see Faragher, Daniel Boone, 331; Bakeless, Master of the Wilderness, 139. ^ Faragher, Daniel Boone, 147–47. ^ Faragher, Daniel Boone, 154. ^ Faragher, Daniel Boone, 155–59. ^ Bakeless, Master of the Wilderness, 167. ^ Boone biographers write that Boone was adopted by the chief, but see Chief Blackfish for doubts. ^ For court martial, see Faragher, Daniel Boone, 199–202; Lofaro, American Life, 105–106. ^ Faragher, Daniel Boone, 203, writes without qualification that the Lincolns joined Boone on this trip, while Lofaro calls it a tradition. Other sources give a later date for the Lincoln migration; see Captain Abraham Lincoln. ^ For Boone as a leading citizen, see Faragher, Daniel Boone, 206. ^ a b Faragher, Daniel Boone, 235–37. ^ For border war and prisoner exchanges, see Faragher, Daniel Boone, 249–58. Most Boone biographers tell a story of Blue Jacket, the Shawnee chief, escaping while in Boone's custody in Limestone, and suggest that Boone intentionally let the chief escape because the two men were friends. According to the scholarly biography of Blue Jacket, however, the chief escaped at a later time: see John Sugden, Blue Jacket: Warrior of the Shawnees (University of Nebraska Press, 2000), 82. ^ For analysis of Boone's land speculation failures, see Faragher, Daniel Boone, 245–48. ^ Faragher, Daniel Boone, 266. ^ Faragher, Daniel Boone, 267. ^ Faragher, Daniel Boone, 268–70. ^ Faragher, Daniel Boone, 272–73. ^ Faragher, Daniel Boone, 273. ^ a b Faragher, Daniel Boone, 274. ^ Faragher, Daniel Boone, 274–78. ^ Faragher, Daniel Boone, 279. ^ Faragher, Daniel Boone, 285–86. ^ Faragher, Daniel Boone, 304–05. ^ For Yellowstone, see Faragher, Daniel Boone, 295. For doubts about Audubon's tale, see Faragher, Daniel Boone, 308–10; Randell Jones, In the Footsteps of Daniel Boone, 222. For historians who report Audubon's story without doubts, see Lofaro, American Life, 161–66; Bakeless, Master of the Wilderness, 398–99. ^ For burial controversy, see Faragher, Daniel Boone, 354–62; Jones, Footsteps, 227–30. ^ "2 April 1863". September 5, 2018. ^ Faragher, Daniel Boone, 302. ^ "1968 American Folklore Issue", Arago: people, postage & the post, National Postal Museum online, viewed March 16, 2014. ^ Slotkin, Richard (1973). Regeneration Through Violence: The Mythology of the American Frontier 1600–1860. Norman, OK: University of Oklahoma Press. pp. 268–312. Retrieved August 27, 2014. ^ Faragher, Daniel Boone, 4–7; Lofaro, American Life, 180. ^ Faragher, Daniel Boone, 323–24. ^ Faragher, " Daniel Boone", 328. ^ Faragher, Daniel Boone, 302, 325–26. ^ Faragher, Daniel Boone, 321–22, 350–52; Lofaro, American Life, 181–82. ^ Bakeless, Master of the Wilderness, 162–62; Faragher, Daniel Boone, 39, 86, 219, 313, 320, 333. ^ Faragher, Daniel Boone, 330–33. ^ The complete lyrics of the song can be found online Archived 2006-06-20 at the Wayback Machine. ^ Faragher, Daniel Boone, 338–39, 362; Lofaro, American Life, 180. ^ "The Boone Family, emigrants of 1846". End of the Oregon Trail interpretive center. February 1998. Retrieved 2007-02-11. ^ "Aaron Boone: Everything to know about the new Yankees manager". NY Daily News. December 2, 2017. Retrieved July 5, 2018. Daniel Boone – Kentucky Pioneer Hero, by Wilbur F. Gordy, 1903. Chisholm, Hugh, ed. (1911). "Boone, Daniel" . Encyclopædia Britannica (11th ed.). Cambridge University Press.